Manic Street Preachers have released a video for their Resistance Is Futile track Hold Me Like A Heaven. 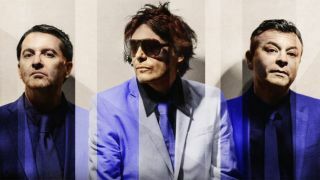 It’s the latest song taken from the new album, with bassist Nicky Wire explaining: “This track sprung from reading Lines On A Young Lady’s Photograph Album by Phillip Larkin, and his poem Aubade as well. The Manics previously released International Blue, Distant Colours and Liverpool Revisited and also shared acoustic versions of International Blue, Distant Colours and Dylan & Caitlin. They’re currently on tour across the UK and will play London’s SSE Arena Wembley later tonight (May 4).